From a small, spartan room in the courtyard of the Ethiopian church off a narrow street in Jerusalem, a 90-year-old musical genius is emerging into the spotlight. For almost three decades, Emahoy Tsegué-Mariam Guebrù has been closeted at the church, devoting herself to her life’s twin themes – faith and music. The Ethiopian nun, whose piano compositions have enthralled those who have stumbled across a handful of recordings in existence, has lived a simple life, rarely venturing beyond the monastery’s gates. But this month the nonagenarian’s scribbled musical scores have been published as a book, ensuring the long-term survival of her music. And on Tuesday, the composer will hear her work played in concert for the first time, at three performances in Jerusalem. Guebrù may even play a little. Her music has been acclaimed by critics and devotees. Maya Dunietz, a young Israeli musician who worked with Guebrù on the publication of her scores, says in her introduction to the book that the composer has “developed her own musical language”. Guebrù’s inspiration comes not only from her faith, but from her life: an extraordinary journey from an aristocratic family in Addis Ababa, with strong links to Emperor Haile Selassie, to a monastery in the historic centre of Jerusalem . She was born Yewubdar Guebrù on December 12 1923 and lived in the Ethiopian capital until, aged six, she and her sister were sent to boarding school in Switzerland. In one of two seminal moments of her life, there she heard her first piano concert, and began to play and study music. After her return to Addis Ababa, and a period of exile for her family followed by yet another return, Guebrù was awarded a scholarship to study music in London. But she was unexpectedly denied permission to leave by the Ethiopian authorities. In the bleak days following this calamity, Guebrù refused food until, close to death, she requested holy communion. Embracing God was the second seminal moment of her life. 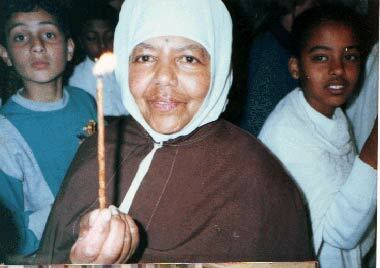 She abandoned music to devote herself to prayer, and after several years joined a monastery in northern Ethiopia. She spent 10 years there, barefoot and living in a mud and stone hut. It was here she changed her name to Emahoy Tsegué-Mariam. It was only after rejoining her mother in Addis Ababa that Guebrù resumed playing and composing and even recorded a few albums. Guebrù and her mother later spent six years in Jerusalem, and she returned to the Holy Land to take up permanent residence after her mother’s death in 1984. She has remained at the imposing circular Ethiopian church ever since. The couple found Guebrù sitting at the piano in her room at the church, and began a series of visits. “In the beginning there was a lot of silence. We felt there was a lot of longing and sorrow and loneliness, but slowly a connection started,” said Dunietz. Guebrù was still playing and composing in her room, but she had not performed in public for several years, and her music was “not much appreciated” within the monastery. Dunietz immediately understood the importance of publishing the nun’s scores to create and preserve a musical legacy, but the project did not get off the ground until two years ago. “She handed over four plastic bags — old wrinkled Air Ethiopia bags — containing hundreds of pages, all muddled up, a big mess, written in pencil, some of them 60 or 70 years old. It was all the pages of her music that she had found in her room. ‘Make a book’, she said.” It was, added Dunietz, “like an archaeological dig” to piece together the scores. Daunted by the task, Dunietz sought the help of the Jerusalem Season of Culture, which organises an annual summer festival of art, music and food in the city. As well as the book, the three concerts have a huge significance for Guebrù. “This is the first time she will hear her own music performed in concert by professional artists,” said Duenitz, who will play the piano. “It is what every composer wants.” Guebrù, she says, is feeling overwhelmed by the attention and has largely withdrawn into the solitude of her monastery room, declining requests for interviews and meetings.